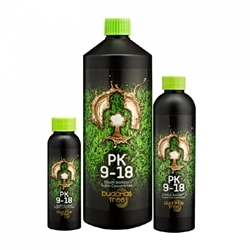 Bloombastic is an extremely strong PK (with an NPK of 0-20-21) which is suitable for use in the final weeks of flowering. Suitable for use with soil and all hydroponic systems, Bloombastic helps to increase the sugar content in fruits and flowers, increasing the potency of fragrances and improving flavour. This extremely concentrated booster will add weight to your yield, whilst its dilution rate of 0.5ml - 1ml per litre means it provides excellent value for money. Bloombastic is available in 100ml, 325ml, 1250ml or 5.5L bottles.